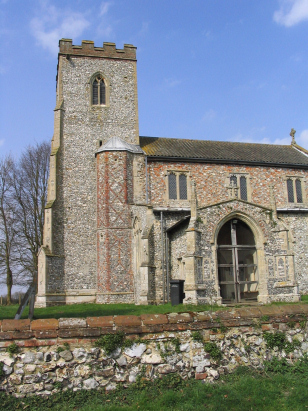 The parish of Little Massingham lies in western Norfolk roughly midway between the market town of Fakenham and the port of King's Lynn. The village is adjacent to the ancient Peddar's Way footpath and just south of the A148 which links King's Lynn with Fakenham. 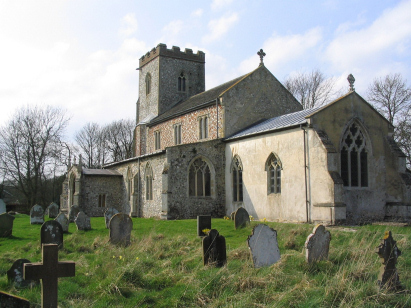 Little Massingham village is little more than a half mile north of its much bigger twin Great Massingham. There is very little in the way of residential settlement - mostly farms and cottages along the lane which links Great Massingham to the A148 and centred on a "T" junction with another narrow lane. A single standard 800-entry register book covers the period of the transcript and indeed continues to modern times being closed in 1999. This register, a fairly recent deposit, is filmed on Microfilm MF1699 in the collection of the Norfolk Record Office and from which this transcript was prepared. The film is recent and benefits from the quality improvements achieved nowadays. There is a clear and contrasting set of images which are easy to view and interpret. Subject to the usual caveats regarding quality of handwriting this was a straightforward transcript to produce and it is to be hoped few errors will have crept into its production.